Branches and twigs bound together to form bundles typically 1ft (30cm) diameter x 8ft (2.4m ) long. The specification for faggots can vary but typically a range of branch diameter material is used. 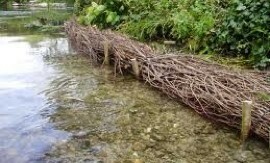 The bundles are positioned along river banks to slow water flow and encourage the deposit of silt helping to prevent river bank erosion. The bundles can be secured by chestnut posts.